This book examines how mass media debates have contributed to the politicization of the European Union. The public controversies over the EU’s attempted Constitution-making (and its failure) sowed the seeds for a process of politicization that has advanced ever since: an increasing visibility for the EU in mass-mediated public debates that is combined with a growing public contestation over Europe within national politics. 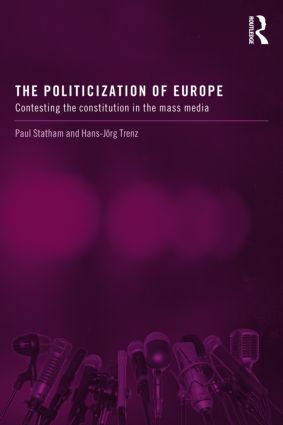 The book presents an original systematic study of the emerging field of political discourse carried by the mass media in France, Germany and Britain to examine the performance of Europe’s public sphere. Whilst the EU’s increasing politicization can be seen as beneficial to European democracy, potentially ‘normalizing’ the EU-level within national politics, the same developments can also be a threat to democracy, leading to populist and xenophobic responses and a decline in political trust. Such discussions are key to understanding the EU’s legitimacy and how its democratic politics can work in an era of mediated politics. The Politicization of Europe will be of interest to students and scholars of comparative politics, media studies, communication, sociology and European studies.